Yet another amazing game by Ainsworth gaming is Dolphins. You can play the game on any reputed online slot game website. The game is simple yet entertaining. It keeps the interest of the player intact with its outlook and gameplay both. Dolphins by Ainsworth have a total of 5 reels along with 30 major paylines. These allow the players to win some exciting rewards. Moving on to the compatibility of the game, it can be easily played on any of the commonly used devices these days, which must have a healthy Internet connection and an updated internet browser. All of it combined makes the game a worth playing slot game. More details of the game are elaborated ahead, which will help you understand the game better. For any game that is out there in the gaming world, a higher RTP, i.e. Return to Player is quite important, be it from the player’s point of view or the developer’s. The higher the RTP rate, the more successful the game will be. But, in Dolphins’ case, this is not the case. The RTP of 94.3% is a decent one but not great for Ainsworth. The maximum win that you can get in this Ainsworth’s Dolphins is 4800 coins. The golden galleon in Dolphins is known to be the most rewarding symbol. If you happen to land 3, 4 or 5 on the same payline, you will be rewarded 1.67, 3.33 or 33.3 times of your total stake. The dolphin that appears on 3, 4 and 5 reels, while you are playing the base game, is a wild symbol. It’s important to know that this wild symbol does not give any pays. This wild symbol replaces all the other ones but the scatter. It can also land you with full stacks. The dolphin symbol only gets added to the last three reels, so if you are thinking of forming or making different combos out of wilds, know that this isn’t an option. The developers of this game, Ainsworth has made the theme along with the gameplay quite simple than the other games. If you play this game closely, you will find that Dolphins has no frills to its design. With an ocean theme out there on the background of the game, it has other symbols too. The reels that are plain white include A to 9 symbols with the selection of different objects. These objects can be counted as various other symbols of the game; shells, tropical fish, pearls and treasure chests. Bonuses are really important to make a player come back to play again. The more the merrier. Such bonuses make sure they impact at large and leave the players with no choice but to return back and play the game again. These game bonuses can be of a lot of different kinds. One is the number of coins one player can win, and the other is free spins that keep the players excited during the whole course. Treasure: Well, who doesn’t like treasure after all? When you are playing a game where the treasure is involved, you are likely to go after it. Going and taking away the chests of treasure in Dolphins is the reason because of which you’re playing this game. 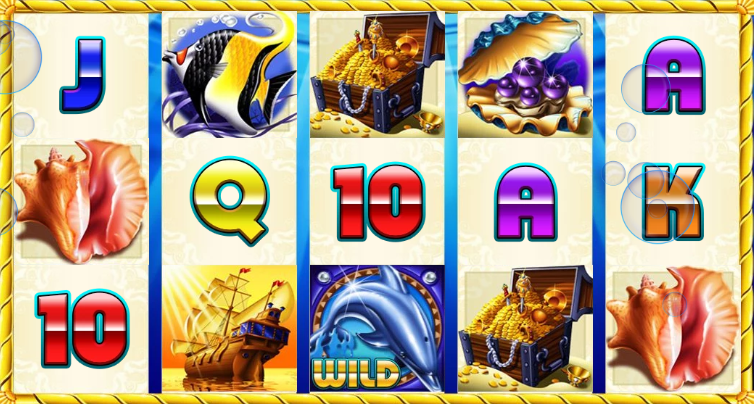 Free Spins: The likeliest way you can win the chests of treasure is through the bonus round. This bonus round rewards up to 15 free spins that come with stacked wilds. The condition is that they need to land on middle 3 reels. Theme: The theme plays a huge role in keeping a player interested and busy throughout the game. With marine life in the background, there is an ooze of inspiration floating around the screen. This certainly adds up the interest in Dolphins. Ainsworth’s other slots are often known to be the back affairs, but if you take Dolphins, it is pretty simple. The visuals and sound effects used in this Ainsworth developed game are quite normal. Even the gameplay does not offer anything new in Dolphins. In total there is another element, volatility of Dolphins. Well, the volatility is said to be as medium by the game’s developers, Ainsworth. The good catch about this game is that you get decent and quick rewards, rather than getting old waiting for these rewards to reach you. 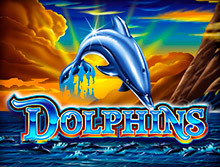 The casino’s edge in Dolphins is quite high than the standard normal if we happen to make comparisons with other slots. With average visual designs, the only aspect that stands out and interests a player is the marine theme. In total, to conclude Dolphins is a game that should be played for total entertainment. Why? Because it is quite a simple game that does not offer much pay but keeps you busy throughout.